Eating spaghetti without looking like a slob or pathetic Lady and the Tramp reject is almost as difficult as looking at this photo of Hugh Jackman without laughing. Here to make things easier on you, the Automated Twirling Spaghetti Fork. 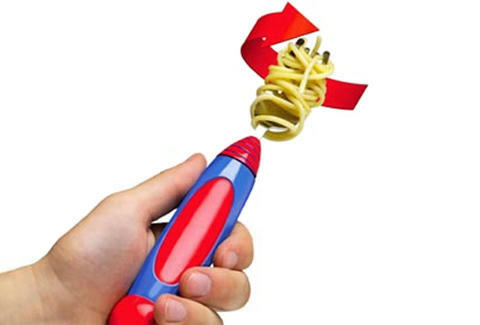 Pop two AAA batteries into this dining gadget to start twirling all the pasta you can handle. The fork is dishwasher-safe and saves you from saucy chin syndrome, but we recommend you leave this guy at home. The waiters in Little Italy are likely to be less impressed by your high-tech utensil.